Other mistake: Episodes 4 and 5 of season 1 aired noticeably out of order. In episode 4, "The Nanny," Alex's former Nanny, Rosalba, comes to work at his podcast company, and its name, "Ajana," is mentioned a few times. 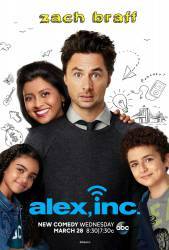 But episode 5, "The Mother-in-Law," starts with the company unnamed; over the course of the episode, Alex learns of the concept of "ajana," the unknown, from his mother-in-law and chooses it as his company's name.